Could this easy 5 step routine cure your stage fright? Pounding heart. Shaky legs. Sweaty palms. We've all been there. 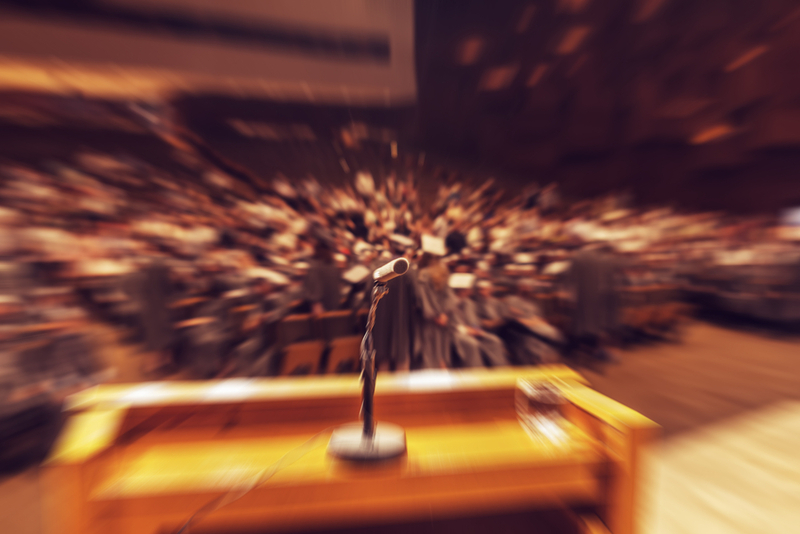 Here are 5 tips (and gifs) to help you beat performance anxiety and get through your presentation in one piece. Obvious, right? But what people don't say is that it's as much about the quality of practice as the quantity. Being in a new environment with unknown variables can throw your focus off your presentation. Minimise this by recreating your presentation environment as much as you can. Wear the right clothes, set your computer or tablet up in the same way, keep to the right timings. When you come to give your presentation, you'll have more room in your head for the things that matter. It's natural to try to calm yourself down when you're feeling stressed or anxious. But it mightn't be the best solution. A big part of what you're feeling is chemical responses in the body. So, rather than fighting them, try working with them by telling yourself that you're excited, not scared. One study showed that people who were told to focus on their excitement were 'more persuasive, competent, confident, and persistent'. The excited speakers spoke for longer and reported being more comfortable. Imagining yourself succeeding can help you to succeed in real life. One study even suggested that mental practice could be as effective as physical practice in sports like weightlifting. Picture yourself delivering the best possible presentation, and being congratulated for it. Imagine everything in as much detail as you can – the faces of the people around you, the details of the room, physical sensations and your emotional responses. If you've done it once – you can do it again. Standing up to speak in front of other people is understandably terrifying. It makes us feel self-conscious, vulnerable and exposed. Shifting your focus away from yourself and onto your audience reduces that fear. Tell yourself it's not about me. Remind yourself that you're there to do a job, and your audience probably aren't even that aware of you. Not everyone is thinking about you, judging you, criticizing you, or laughing at you. [...] If you are nervous that the world is hanging on your every mistake, get over yourself! Better? Focus on your audience and what they need and deserve from you in the next 20 minutes. Find someone you trust and perform your presentation for them. Have them take notes as you speak – are you speaking at a good pace? Are there confusing bits? Are you too stiff or formal? You could even set your critic the challenge of remembering important bits of information from your talk. If they can't remember them, adjust your delivery to make them more memorable. Just practising with another person in the room can help – one presenter practises in front of his baby daughter. Do you have any tried and trusted techniques for overcoming stage fright?